Keiko Shin Karate Academy students do well at international competition. Keiko Shin Karate students learn a few things in Vegas tournament. Pasco: Wesley Chapel karate instructor builds self-confidence. Wesley Chapel karate instructor builds self-confidence. Keiko Shin karate academy takes pride by placing number ONE in the Nation after returning from AAU National Karate Championship in Raleigh, NC this past July 5th. Keiko Shin Karate Academy (KSKA) members and families are preparing to celebrate the biggest achievement of the year. After months of preparation, enduring all types of cross training, cardio, yoga and intense hours of traditional Shotokan karate, 20 students embarked on a journey from Florida to North Carolina to face the elite, top karate competitors not only Nationally, but also competitors from Israel, Romania and Canada. With a high level of competition and over 2500 contenders, our 20 athletes ranging from the age of 6 to 40 years old took the Nation by surprise by sweeping all divisions that they participated in. At the end of 3 consecutive days of nail biting, intense challenges, our team walked out of the Raleigh Convention Center with a total of 34 medals. Out of the 34, 22 were solid gold! This result is not a surprise for this small local academy. On the trail that led to the Nationals, throughout the season and in an effort to qualify, our students had already claimed a total of 74 gold medals, 43 silver, and 37 bronze. All of this could not be possible without the knowledge, accreditation, skill, patience, perseverance, and dedication of the two head instructors of KSKA; Sensei Alex Fuentes and Sensei Ernesto Fuentes. “I couldn’t be more proud of our students desire to have their name put in the AAU Wall of Fame and the support of the families involved in this journey” says Sensei Ernesto Fuentes with great pride. In addition to his passion for teaching and sculpting excellent citizens for our Nation’s future, Sensei Ernesto is a proud member of the Florida Hospital Health and Wellness Center which helps him to reach out to the community with the message of living a healthy life. Tora No Maki Challenge is a Traditional Karate Tournament hosted by Shotokan Kenkojuku Karate Dojo in Perry, Florida. It is the last tournament of the year therefore it is the most challenging event with most experienced competitors in attendance. This year's event was held on November 9th, 2013 and competitors from Keiko Shin Karate Academy in Wesley Chapel welcomed the challenge. 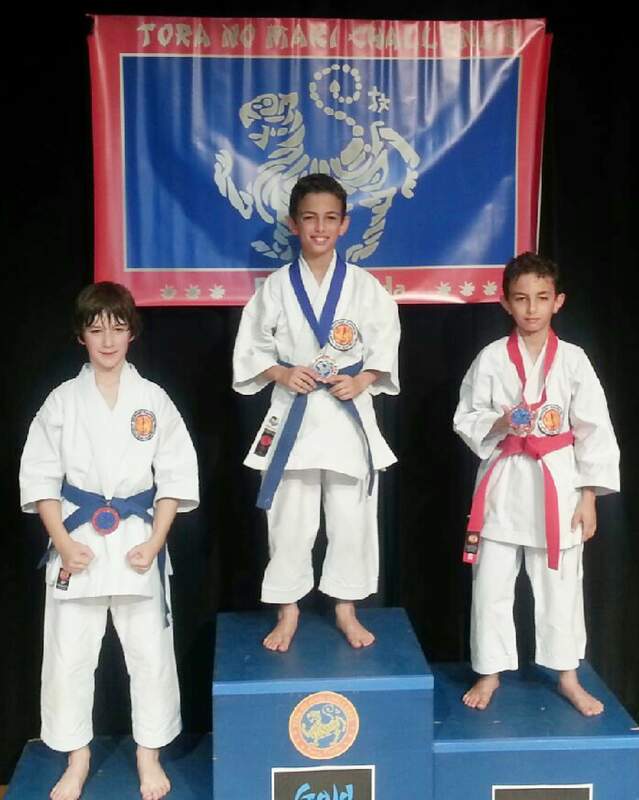 13 students under direction of Sensei Ernesto Fuentes returned home with 13 gold, 8 silver, and 4 bronze medals. Interestingly - students from Keiko Shin Karate Academy in Wesley Chapel made a clean sweep of all medals in the Intermediate Kata Division for 10-11 year old. Keiko Shin Karate Academy continues to impress with its students' performance at various national and international events. Their outstanding results during last Pan-American Championship in Panama and continuing successes at all national level events proves that Keiko Shin Karate Academy of Wesley Chapel under capable direction of Sensei Ernesto Fuentes is the force to be reckoned with. Students from Wesley Chapel Karate Academy win 48 medals at National Karate Championship in Cape Coral, Florida. Wesley Chapel, FL - Competitors from Keiko Shin Karate Academy participated in National Karate Championship in Cape Coral, Florida on October 19th. Keiko Shin team of 26 competitors, under direction of Sensei Ernesto Fuentes returned home with 23 National Champion titles (gold medals) and 25 silver and bronze medals. Keiko Shin team was represented in all age groups ranging from 5 year old to adults. Keiko Shin Karate Academy continues to impress with its students' performance at various national and international events. Their outstanding results during last Pan-American Championship in Panama City, Panama and continuing successes at all national level events proves that Keiko Shin Karate Academy of Wesley Chapel under capable direction of Sensei Ernesto Fuentes is the force to be reckoned with. 16 Wesley Chapel Karate Students carried the entire USA on their shoulders!! After being appointed by Shotokan Karate-do International Federation (SKIF) – Headquarters Japan to be the USA leader dojo at The Pan-American Championship Tournament, in Panama City, Panama ; 16 students with over 200+ hours of intense training put the mark in the history of USA Traditional Karate. 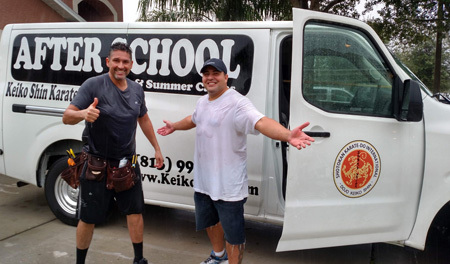 This past August 2nd and 3rd, Keiko Shin Karate Academy located in Wesley Chapel, FL. traveled to Panama with the firm intention to represent the entire Nation against other countries from around the world. With only sixteen competitors, the local Karate Academy participated in the 8th Pan-American Championship and faced other teams with hundreds of members like Venezuela, Costa Rica, Mexico and Dominican Republic. The local but determined Wesley Chapel students stunned the 17 other countries like Brazil, Uruguay, Argentina, Panama, Puerto Rico, Ecuador, Colombia by positioning the USA in overall 5th place! After 3 days of strong competition, the team came back this past Monday August 5th with 18 medals more enthusiastic than ever and proud of their instruction and training from Sensei Ernesto Fuentes. Sensei Fuentes graduated in Okinawa, Japan as International Karate Instructor and has been teaching Martial Arts since 1997. Under his instruction and intense training, his local Academy has produced dozens of National, Regional and Pan-American Champions every year for the past decade. Besides the fact that karate has had a major impact on every student that enrolls into his program, Sensei Fuentes strives for providing to our community, disciplined and goal-oriented students. Keiko Shin Karate Academy is an established strong Martial Arts Academy located at the Grand Oaks Square shopping plaza. For information about his team and how to be part of this amazing group of students you can review their webpage at www.kskaonline.com or calling at (813) 994-9253.